“Flygplanskort” – in English ”Aircraft Identification Cards” has been publicised in many editions, the first probably in 1925. The first editions were printed on separate cards of thick paper. Later they were collected in binders. In 1950, Flygplanskort was printed on oblong, folded papers – “the accordions”. The edition consisted of five parts – four describing the aircraft of the NATO and of the Warsaw Pact countries and one of Swedish aircraft. In 1978, Flygplankort was edited as a book of small size (about 10 x 15 cm) with photos and three-plane profiles. A new Flygplankort, enlarged and larger in size (21 x 15 cm) was edited in 1987. Flygplankort 1999 is a real encyclopedia of modern military and civil aircraft of nearly 400 pages and with photos in colour. It is sold to the public by Flygvapenmuseum (among others). The purpose of the Flygplankort need not to be explained. During the years before WWII, an air defence warning system was built up. Sweden was divided into Air Defence Areas (luftbevakningsområden). Observing stations were arranged along the coasts and frontiers and in lines within the country. An organization of voluntary air observers was also established within the defence. Flygplanskort was an important part in the training of the personnel. After the outbreak of WWII, the organization of optical air defence observation posts grew quickly. Observation towers, mainly manned by young women (often called “tornsvalor” in Swedish meaning “swifts”), were built all over the country. Some of these towers are still standing pointing into the air as monuments of old days. The first radar plants in the Swedish air defence were procured after the end of WWII. 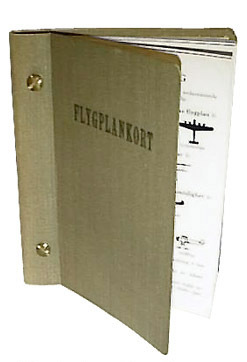 On the following pages, Flygplankort from the late thirties or early forties reproduced. They are from the collection of Lars Sundin, Stockholm.